Today I visited the old Columbia Records factory in the Athens suburb of Rizoupoli [Ριζούπολη]. The first of its kind in Greece, the factory was established in 1930 by the British Columbia Graphophone Company in order to expand its activities in the Middle East and Balkan regions. Construction work began in 1928 and was finished in December 1930, with the site spanning 3.5 acres at 127 Iraklion Avenue [Λεωφόρος Ηρακλείου 127]. The first 78rpm shellac disc was pressed on December 20th, 1930, however an actual recording studio was not established on the site until 1935, dubbed “Studio III”. It had a long life span, and was in use right up until 1965. Columbia-EMI’s “Studio III”. c. 1936. 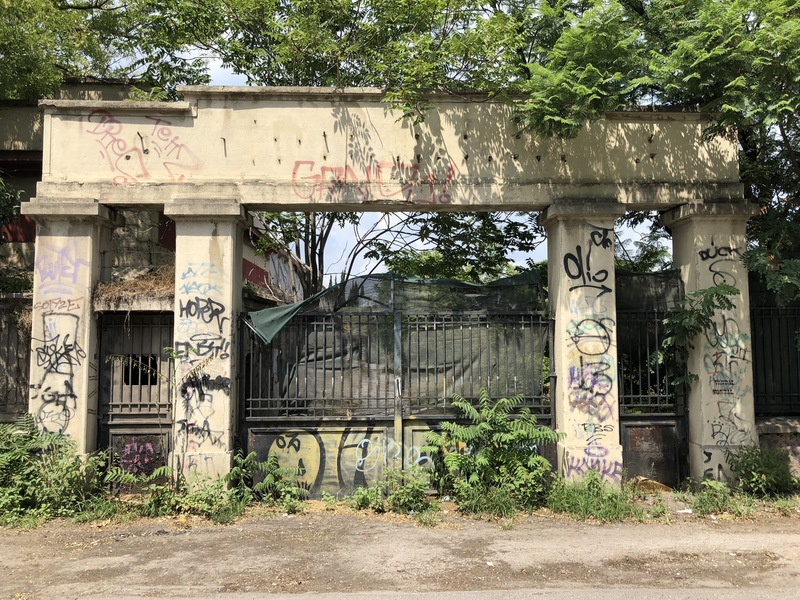 In 1941, the German occupation of Greece effectively ended the activities of local record companies, and the site was re-purposed as a repair centre for military vehicles. Metal masters were melted down for scrap and valuable company documentation was destroyed. The factory also underwent further damage during the Greek Civil War of 1946-1949. In the years that followed, up until the 1980s, the company experienced its “golden age”. Hundreds of Greek music records were produced, featuring the leading composers, lyricists and musicians of the day. Great success was also achieved with the manufacture and exportation to the Middle East of LPs and cassettes. Telegram sent by the British resident engineer at the Athens Columbia studios to the head EMI office in Hayes, Middlesex when the German army invaded Greece in 1941. Courtesy of Paul Vernon from the EMI archives. The factory’s demise began in 1983 when the recording studio was closed, and later in 1991 the whole site was shut down for good. During its 60 years of operation over 200,000 songs were recorded, making it a landmark site in the history of music and recorded sound in Greece. In 2006, plans were made to preserve the area and turn the remaining buildings into a museum. This plan came to nothing, and the site was left abandoned and derelict. Photo of Antheon Street [Οδός Ανθέων], parallel to Iraklion Avenue [Λεωφόρος Ηρακλείου]. Derelict building visible behind trees. Going down Iraklion avenue from the Perissos metro station [Σταθμός Περισσός], I scaled the perimeter of the complex, now shrouded by overgrown shrubs and barbed wire fences with green mesh. A car beeped at me as I stood in the middle of the road trying to take a good shot of the infamous main gates. Looking very out of place, a car pulled up beside me on Antheon Street, parallel to Iraklion Avenue. A middle-aged man in a black SUV asked me in Greek if I was a tourist, and I responded by telling him that I was visiting from Sydney. Content with my answer, he wound up his window and drove off. Australia too has been guilty of ignoring its recorded sound history. The Columbia record factory on Parramatta Road in the Sydney suburb of Homebush was the epicentre of local recording and record manufacture from its inception in 1926 until the 1950s. Today it is a large storage facility, with the only hint of its past being a street sign bearing the name “Columbia Lane”. Its Greek counterpart reveals its former life through the name of the bus stop adjacent to the main gates, proclaiming in bold, capital letters: ΚΟΛΟΥΜΠΙΑ. Columbia Lane, Homebush, NSW, Australia. In an act of cultural vandalism to rival the Elgin Marbles, the original “Columbia” letters and two “magic notes” logos on the gate had been torn down. Natalie Rassoulis was first to raise the alarm through a Facebook post made on January 30th. Having recently passed by the site on a train ride, she expressed shock and anger that the signs had been torn down without prior approval or permission. One photo seems to show the process of removal, with only the first four letters of the company name visible. The other shot shows a van parked on the roadside with a ladder leaning on the main gates. Front gate. Missing letters and logos. July 29th, 2018. It is currently unknown whether the removal was ordered by the owners of the complex, or if this was an act of outright theft. Equally unknown is the fate of the signs and whether they have been preserved or destroyed. It is hoped that more information will surface after this article is posted. But for now, these photos document the sad demise of the most significant site in Greece’s music and recorded sound history. Front gates on Iraklion Avenue. Cars coming down Iraklion Avenue. Front gates adjacent. Close up shot of where the original “Columbia” letters once were. On the way to the front gates, Iraklion Avenue. Graffiti, shrubs, ferns, gates and green mesh on Iraklion Avenue. Iraklion Avenue. Κολούμπια/Columbia bus stop visible in the centre. Closer shot of the Κολουμπια/Columbia bus stop sign. Shot of street sign at 124 Iraklion Avenue. Facing Iraklion Avenue on the side of the Columbia complex. Facing Antheon Street on the side of the Columbia complex. Photo of derelict building within the Columbia complex. Barbed wire, trees, graffiti and abandoned building from Antheon Street. Another shot of the Columbia site from Antheon Street. Photos by Michael Alexandratos. July 29, 2018. Still from Dionysis Kouris’ film “Transit in Columbia, Athens” (2010), showing all original letters and logos adorning the main gates, including un-demolished buildings within the complex. Still from Dionysis Kouris’ film, providing a view of the front gates as of c. 2009. Archival photos taken as screenshots from Dionysis Kouris‘ film “Transit in Columbia, Athens” (2010). Photo credits: Elias Petropoulos Papers, Gennadius Library, Athens, Elias Kapetanakis & Dimitris Yfantis. Facebook post of Natalie Rassoulis, January 30th, 2018. Google maps view of the route I walked from the Perissos metro station [Σταθμός Περισσός]. *All links current as of July 29, 2018. I would see old studios from the train when I worked in Athens in 1989. I am so sad at the destruction of such a significant part of Athenian and Greek music and technological culture. I have returned to Athens many times since and thought, couldn’t the site owners made some effort to store the old masters, the ‘notes’ from the front gate?